The Insurance companies, the Automobile Manufacturers and their suppliers have every reason to measure driver behavior. This has already begun with the onboard devices of the insurers for their new "pay how you drive" business model : the idea of ​​car insurance companies is to modulate princing according to the dangerousness of behavior. Then every driver becomes unique and pays an ad-hoc price: An embedded device in the vehicle (or App on the smartphone) scores driving style (using the accelerometers in electronics), and assigns it a degree of risk of accidents. However, the driving style (eg severe braking, or otherwise conduct casting) is not correlated to the risk of accidents. This has been formally demonstrated through collaborative French research programs (particularly in the PREDIT French National Programme on Road Safety), and this also corresponds to the "common sense": someone that passes a stop sign without making a stop (even a severe braking) and without accelerating, quietly, with a low 40 km / h car speed, is extremely dangerous and this driving behavior is highly accident-prone, while driving "calmly". Similarly someone who completely ignores pedestrian crossings (including when a pedestrian is on it) and quietly passes it without braking is very dangerous : first ir is prohibited by the rules, and second, it is accident-prone (with fatalities because it is an accident "vehicle vs. vulnerable"). All current electronic devices that use the driving style as dangerous key for driver monitoring are absolutely ineffective and give false information. Until we interprate the driving style regarding the geometric context, geographical, the weather, condition of the driver etc ..., we absolutely can not conclude anything from a driving style, except for the part called "Eco" ( the more severe is braking, the less retains the inertia of the vehicle, the more fuel is consumed, and therefore also the more CO2 is rejected in the atmosphere). 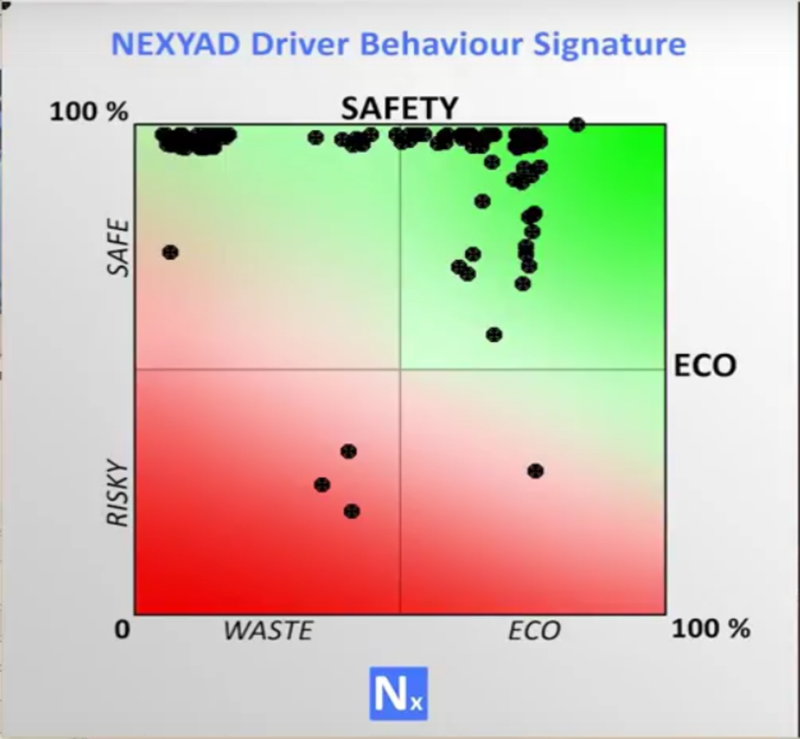 NEXYAD has been designing and developing a software module named Safetynex which allows precisely to estimate the driving style and its relevance regarding the road environment, in real time, and assigns a risk score (score usually presented in reverse: Safety) correlated by construction to accident. SafetyNex is the result of over 15 years of R & D, particularly in the context of 4 French nationnal collaborative research programs (2 PREDIT programs, 2 programs FUI). 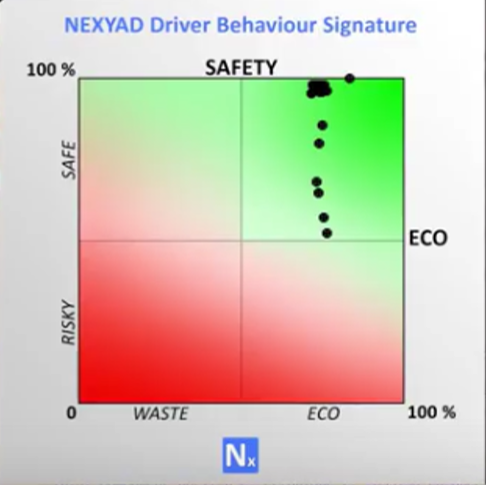 This allowed NEXYAD to extract causal rules of Accidents (working with road safety experts in charge of the rehabilitation of road infrastructure). SafetyNex integrates all those rules and calculates a deducted risk (or, conversely, a note of road safety) at all times. 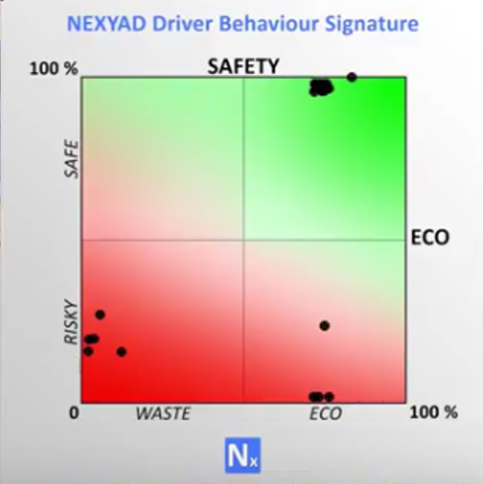 This risk is calculated by anticipation (for real-time applications: you can warn the driver that he should slow down before the dangerous situation), and histogram of risk along a route is the behavioral signature of the driver (behaviour driver monitoring). 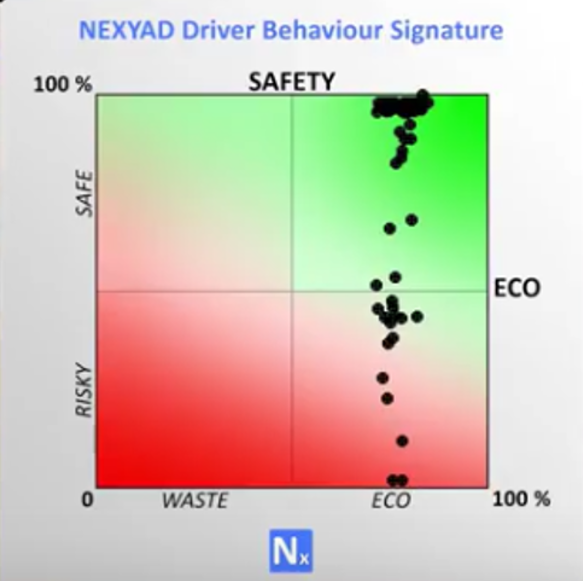 SafetyNex has integrated a second dimension measurement, through a "score of Eco-driving" developed by the SME NOMADIC Solutions. Company, on your own hadware (via an integration of the software), on your centralized computing to handle your databases. robot ... then car manufacturers may become responsible for some accidents (because "they" are the driver).